I am on such a pumpkin kick. I even joke around saying nope this isn’t a bad self tanner application I just ate too much pumpkin, because I eat so much I might turn orange. There are so many health benefits to pumpkin maybe it isn’t such a bad kick to me on. 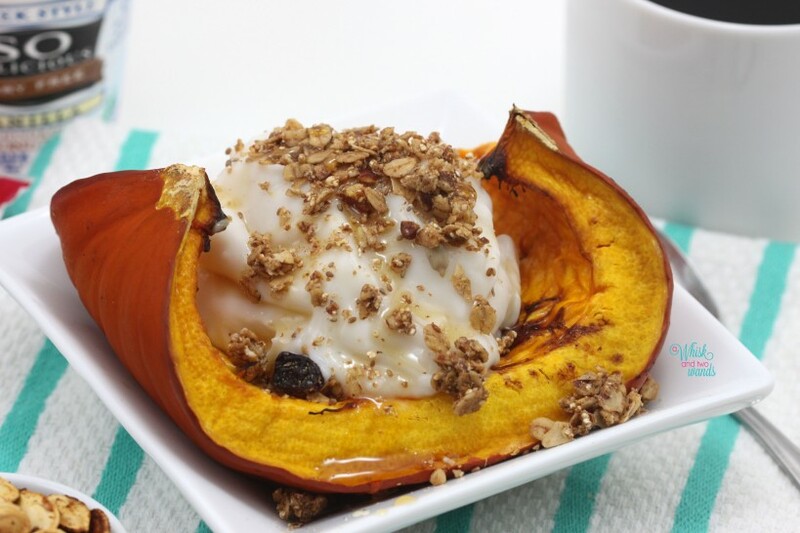 Pumpkin is packed with vitamin A and fiber and low in calories. There are studies showing it can protect you against cancer, is good for your skin, good for you immune system, and they can boost your mode. Maybe that I why I am so happy and love fall. Also pumpkins are great for after a workout! They have more potassium than a banana and extra potassium helps restore the body’s balance of electrolytes. If you cook with real pumpkin you will often not use the whole thing. Or maybe you are like me and will roast a pumpkin with an idea or use in mind for part of it and are looking for a way to enjoy the rest before deciding to freeze the extra for a later use. I recently roasted 3 pumpkins and put part in the refrigerator just in case I thought of a way to enjoy it before the next day. I woke up and decided to make a Pumpkin Parfait! 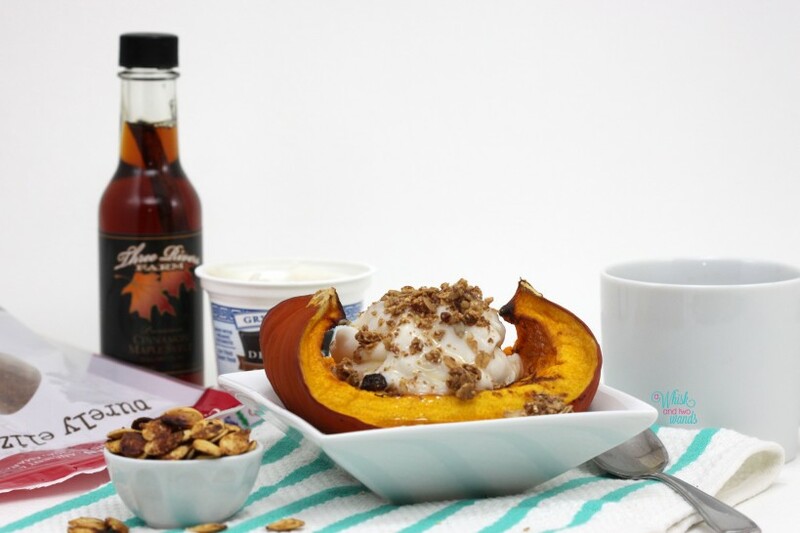 I took my pumpkin out of the refrigerator, topped it with yogurt, granola, and a drizzle of maple syrup and let me tell you it hit the spot! Just like waking up, if you went to sleep and didn’t go shopping, the day after Thanksgiving and enjoying a piece of pumpkin pie for breakfast! Like other recipes this is meant to be for inspiration and customizable, use your favorite yogurt, granola, or other toppings. Bonus to roasting pumpkins, pumpkin seeds!! 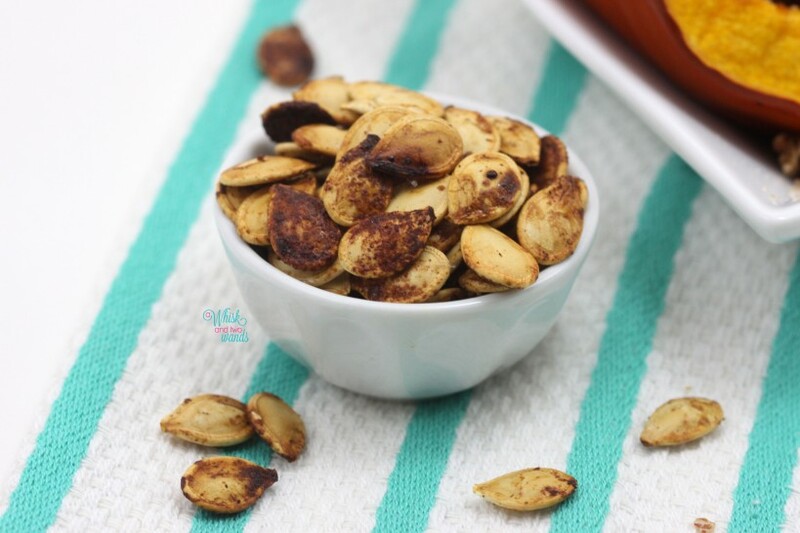 One of my favorite pumpkin seeds is to add sea salt, cinnamon, and cayenne pepper but this time I mixed a little coconut palm sugar and pumpkin pie spice to make a sweeter version! Are you going crazy with everything pumpkin? What is your favorite thing to make with pumpkin or favorite pumpkin treat you have enjoyed recently? 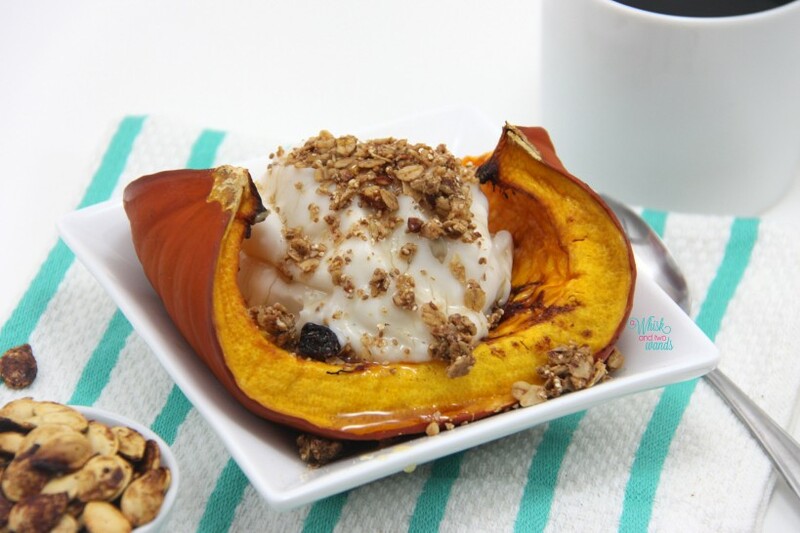 Removed your cooled roasted pumpkin from the refrigerator. If you are enjoying this on the go or making ahead of time you can remove the skin of the pumpkin (or leave it on as it is edible), and place in a container. Top with yogurt and add the granola just before enjoying. 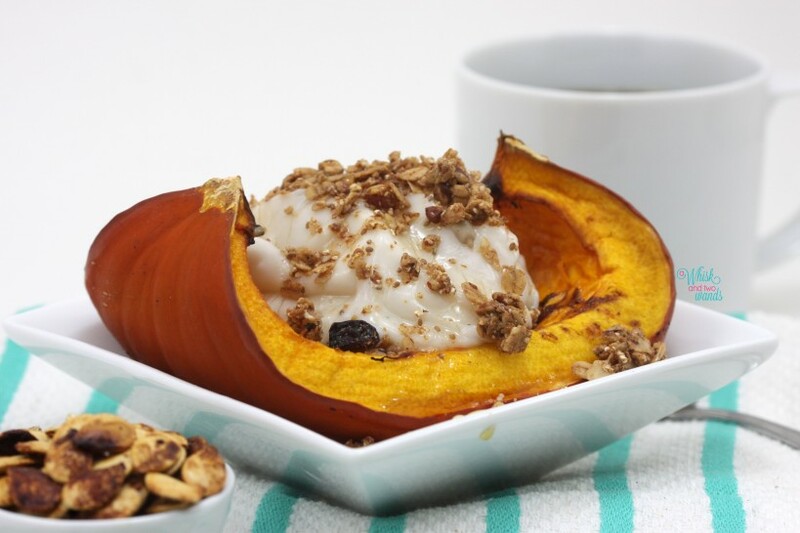 Otherwise top pumpkin with yogurt, granola, and maple syrup. Enjoy! This looks so yummy! Roasted pumpkin is one of my favorite parts of this time of year. Love that you left it whole instead of making it puree. Pumpkin seeds are addicting! Thank you! One of my favorites too! A couple weeks ago I ate a whole pumpkin in one day! Leaving it whole has so much more texture. Pumpkin seeds are so addicting!! I always eat way too many! Mmmm pumpkin! 🙂 When I came home from dinner last night, I proceeded to eat an entire can of pumpkin, LOL! Haha! I ate a whole sugar pumpkin in one day a couple weeks ago! Pumpkin love! This looks scrumptious (as always, your recipes are amazing). ! 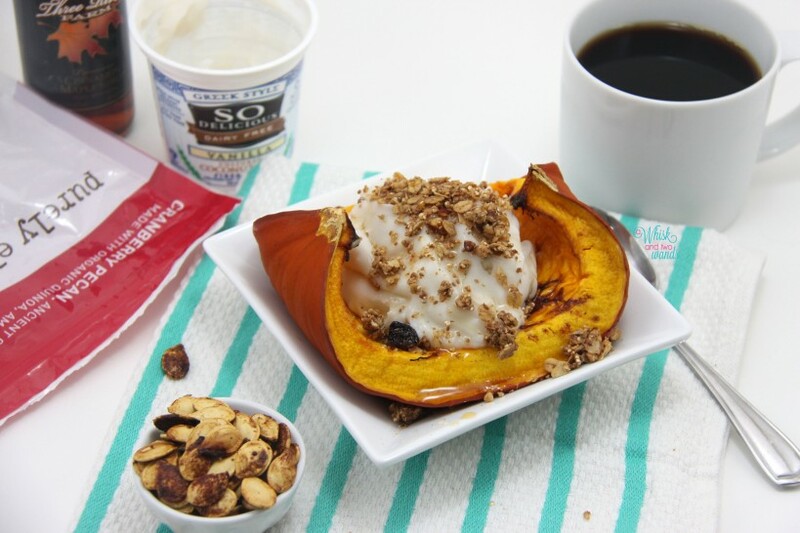 I really need to try the SO Delicious brand of coconut yogurt…I feel like it would probably change my world!